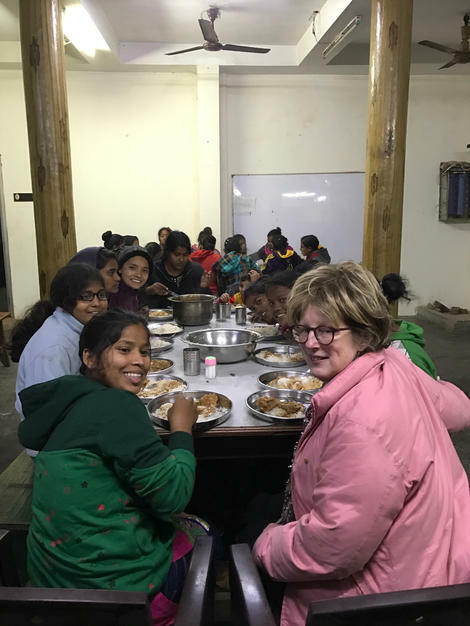 How I happened to go to India this past January is a long and convoluted story involving tragedy, triumph, stubbornness and one very sweet young woman at an orphanage who I’ve been sponsoring for the last 3 years. Since I first began communicating with her, Rosey has been gently suggesting that I come for a visit, but getting to India is not an easy proposition. She lives in an orphanage 300 kilometers to the east of New Delhi, near the border with Nepal. To say that it is remote is putting it very mildly. At first I planned to fly from Delhi to Pantnagar, which would have taken me somewhere close. But that plane only leaves 4 times a week. And it’s often canceled, which, in fact, it was. So then I decided to take the train. When you are going to India, many people have advice for you, most of it harrowing, so when I got to the train I didn’t know what to expect. (I should say that I had hired a guide to drive me to the station. He deposited me in my seat and said, “Don’t move.”) Fortunately, almost all the signs in India are in English. I knew that Haldwani, the stop I was getting off at, was second to last and that it was 5 hours away and that one of the men who runs the orphanage would be picking me up. With Rosey! Still, it is a little daunting to be a middle-class woman from Westchester, NY, with all that means, on a train going into the heart of India. The fabulous thing was that they kept serving food, and I kept eating it. There was cereal with warm milk. There was a very tasty vegetarian thing. Also very tasty desert, and tea. The Indian tea is the best tea I have ever had. Finally we got to Haldwani. It is not a metropolis. I stepped out and looked around and saw no one who looked like Clifton, from the orphanage, who I knew to be very tall, white and Australian. There was no one who looked like Rosey either, who I knew to be very small, beautiful and Indian. I felt a little like Cary Grant in that scene in North by Northwest when the cropduster is coming after him. I felt the teeniest surge of panic, except there was no way out. The next train back to Delhi would not leave for hours. So I followed the direction in which other people were walking and then I said a prayer and then lo and behold I heard a very tall Australian man saying, “Susan?” I had been found. And what an adventure I had. which I will relate tomorrow.